Roof Primer-Shingles, metal or something else? 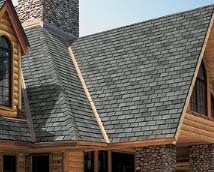 Home|Blog|Uncategorized|Roof Primer-Shingles, metal or something else? The roof you select for your log home can have a big influence on energy savings and provide improved protection from the elements. There are many options available—too many to list here—but we thought we’d give you an overview so that you’ll know what questions to ask. Asphalt Shingles. This is the most common type of shingles. They are available in many grades and colors. Many experts have taken a second look at white or lighter colored shingles because of their supposed reflective qualities. While light colored roof materials do reflect visible light the heat reflectivity is found in the infrared wavelengths of light, and most shingles don’t provide more than about 30 percent reflectivity. This is due to a couple of factors. The pigmented granules, usually a silicate material, have a limited amount of pigment applied. Also, the scattered nature of the pigmented granules diffuse the reflectivity, and reduce the amount of light reflected away from the home. Lighter colored roof shingles were popular in the 1960s but fell out of favor because of the difficulty in keeping them clean, though newer shingles have some self-cleaning properties. Metal Roofing. Metal roofing has a higher reflectivity than asphalt shingles, and also has a longer lifetime than most shingles. Metal roofs can be applied with the vertical seamed appearance, or can be applied with a variety of textures, and imprints to give the appearance of a shingled roof. Metal roofs in northern climates need to have special attention paid, as heavy snowfall can accumulate on the roof and then slide off en masse in a mini-avalanche. For safety, metal roofs have inverted diversion “vees” above entrances, steps or other access points. 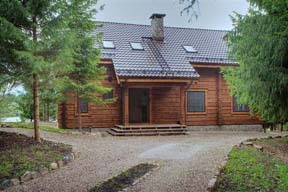 European metal roofs are required to have snow guards, which can take many forms. One pictured here incorporates brackets placed at pre-determined distances connected with up to three bars. 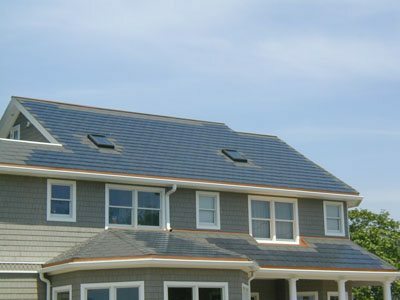 Solar shingles. These specially designed shingles combine surface protection while utilizing the accumulated heat on the roof to provide domestic hot water. The Dawn Solar System absorbs heat generated by the sun shining on a roof (or wall) into a concealed, patent-pending thermal collector from which it delivers heating, cooling and hot water. And because it’s hidden, it’s protected from the elements, which extends product life. Roof insulation is also a key factor in the uppermost boundary of your home. Katahdin’s double roof approach not only keeps your energy bills down, but meets the new federal 2009 IECC regulations for energy efficiency. With the proper insulation underneath the shingles, asphalt shingle color plays less of a role in energy efficiency, as the interior is properly protected from the heat generated on the roof surface.